Thank you to everyone who read my interview post with Sarah Moore, author of Homemade Gifts Vintage Style. The winner of the book giveaway is Jenni Vane Stobbs! Congratulations Jennie! Please email me your address to claireabellemakes@gmail.com so I can arrange for the prize to be sent to you. It has been a while since my last Creative Inspirations post, so I’d like to share with you an interview with the author of one of my favourite books, Homemade Gifts Vintage Style. I know you will all give a warm welcome to Sarah, the designer and maker behind Sarah Moore Vintage and I hope you enjoy hearing about her handmade and vintage world. 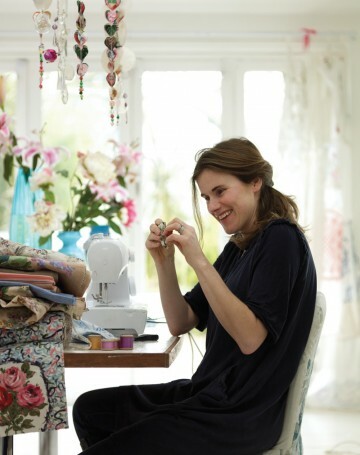 Can you tell us a bit about your background and how you came to build a business around vintage and handmade? The start of my vintage business was due to an impromptu addition to the suppliers page in the back of my vintage book. I have a background in cooking, running a commercial kitchen for London events company Lettice for ten years and then designing menus and service equipment for them. It was really hard work but great fun. These guys then went on to launch a sister company called Biscuiteers. A great brand that makes amazing hand iced biscuits. I did the development for all of the recipes and designed their collections of biscuits and was asked to write a book for them. This was quite hard work, but even more fun. I talked to the team at Kyle books as we were putting the Iced Biscuits book together and pitched them ideas for a book about my other passion, Vintage. Homemade Gifts Vintage Style was commissioned and written, about to go to print when they asked for a suppliers page at the back. I popped my name first on the list of other established suppliers and sent it off for print. I then had four months to start the business before the book hit the shelves. Since then the boundary between work and fun has been blurred. I love old stuff. Wallpapers and fabrics are my favourites and once a little pile of these had built up I wanted to use them to make lovely things to show off their beautiful designs. What do you think it is about vintage and reclaimed items that people are drawn to? Old fabrics and vintage pieces have that old fashioned feel of quality, care and regard that many of our newer slightly disposable homewares lack. I think that nostalgic feeling, the good ethos of making do and mending and a legacy of fantastic design makes reclaimed stuff more appealing. The magpie in people is awakened by vintage pieces too. The search is as much fun as the product. Many a trip out buying has seen the latest haul polished or washed or folded or rolled neatly on the top of the piles of yesterday’s find in our house. Only to roll down the pile and be replaced tomorrow. I first learnt about your work through your book ‘Homemade Gifts Vintage Style’ and have since discovered your online shop, blog and studio. How do you manage to maintain a balance between the different areas of your business and what do you enjoy the most? I am not great at balance. Blog has been neglected as I have been writing a new book and for Country Living magazine, studio screams priorities if a bespoke order is placed and shop ticks along with seasons or find dictating what is included. I love it all. apart from blog guilt! 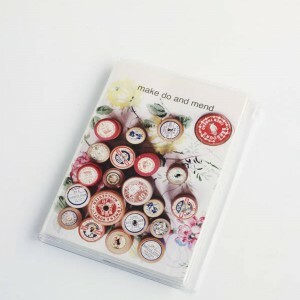 I’m completely smitten with your stationery range! How do you source stock and find inspiration for new product lines? I find materials I buy very inspiring. The fabrics and wallpapers are just so colourful that you want to use them in as many ways as possible. I find my stuff by getting up early and going to markets, by popping into charity shops regularly and looking online. The stationery was produced by Kyle books as part of a collection. The mini notebooks are my favourites as they are perfect size for writing out my vintage wish lists. You say that during busy periods you get help from locals in the surrounding villages. To what extent would you say that community is important to your work? I love the fact that local people are involved. It has made a real connection with people from our area who I would probably not come across in day to day life. It is more like therapy than work as we gather in our village hall sewing and making. If you had one piece of advice for fellow handmade artisans, what would it be? Don’t undersell your pieces. It takes hours to make some things, hours to source the materials, and if you present things over the web, ages to update and pack and send your pieces. Make great things with a good design and charge what it is worth. The hourly rate will still probably be less than minimum wage! And finally, a fantasy question. If you could have a snoop and rummage around anyone’s home, who would that be?! The queen. I wouldn’t want to see around her smart houses, except to check out the wallpapers and fabrics. Her lofts, out building, stores and barns would be enough from all those estates. There must be some amazing wallpapers and curtains leftover from previous decorating schemes. I have some fragments of gilded plaster from frames and finials and mouldings and think there must be scope to increase these. Thank you so much for joining us Sarah, it’s been wonderful to learn about your journey! I especially envy your charity shop visits and community sewing. What a lovely way to work. I’ll definitely be revisiting your book for some Christmas present inspiration this year. 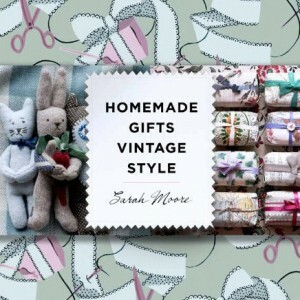 Sarah has kindly offered to give away a copy of Homemade Gifts Vintage Style to one lucky reader. To enter, please complete the following steps. Sign up to the Sarah Moore Vintage Newsletter here (compulsory). Follow both @SMVintage on Twitter & @claireabellemks on Twitter for an additional entry. 1. This giveaway is open to UK residents only. 2. You must complete the requirements as stated above for a valid entry. 3. The giveaway will close on 7 December 2012 and the winner will be announced shortly after on this blog. 4. Sarah Moore Vintage is responsible for delivering the giveaway prize.